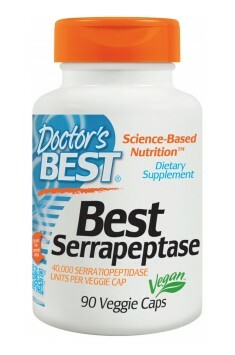 Doctor’s Best Serrapeptase is a dietary supplement in the composition of which there is serrapeptase – proteolytic enzyme with anti-inflammatory and analgesic properties. Each capsule contains 36 mg of pure serrapeptase with very high activity – as much as 120.000 SPU. The preparation is recommended as a natural means decreasing pain symptoms and inflammations. It brings relief especially in the case of chronic ailments of upper respiratory tract. Thanks to anti-atherosclerotic properties, it may constitute an element of prophylaxis of cardiovascular system diseases. When added to a meal containing protein, it facilitates digestive processes. Serrapeptase belongs to proteolytic enzymes, i.e. substances catalyzing protein breakdown. It may be found naturally in the intestines of silkworms. These insects use it to digest hard leaves of mulberry and to dissolve cocoon. In supplementation, serrapeptase created as a result of fermentation is used, with the use of helpful bacteria Serratia E15. Serrapeptase is a systemic enzyme – after getting in the organism, it absorbs directly from the intestines to the bloodstream. Similarly to all proteases, it facilitates protein digestion, however, its main application involves the therapy of diseases accompanied by inflammation, swelling and pain symptoms. This compound is also recommended to improve the condition of the cardiovascular system. In many countries, serrapeptase is a natural and safe substitute of salicylates and non-steroidal anti-inflammatory drugs (NSAIDs). It shows similar and equally effective properties and simultaneously it is devoid of side-effects. Serrapeptase has analgesic effect thanks to blocking the release of amines responsible for pain conduction (e.g. bradykinin). It has been proven in the research that as early as after 5 days of application, a significant improvement may be observed and smaller pain symptoms accompanying joint inflammation. Additionally, serrapeptase decreases inflammations. It dilutes liquids accumulating in the area of damaged tissues and facilitates their elimination. It decreases swelling and edema, which in turn accelerates the regeneration process and shortens the time needed to heal. Serrapeptase may improve the state of the cardiovascular system. It is able to dissolve fibrin – a protein supporting blood flow and responsible for its proper coagulation. The disorders in its activity lead to dangerous blood density and play an important role in pathophysiology of atherosclerosis – fibrin constitutes a scaffolding for clots. A valuable property of serrapeptase is the fact that it digests only dead tissue, without influencing the healthy one. Thanks to this, it effectively clears the organism from all kinds of clots, cysts and plaques. One of the most important reasons for such a low effectiveness in eliminating bacteria from the organism is its specific and very effective defense mechanism. It consists in forming special biofilm, which makes these bacteria “invisible” for the cells of the immune system and resistant to the effect of chemical compounds designed for their neutralization. Serrapeptase inhibits the creation of bacterial biofilm and dissolve the existing one. Thanks to this, bacteria may be recognized and eliminated thanks to the defense mechanisms of the organism. Serrapeptase works synergistically with the majority of antibiotics, intensifies their activity and increases effectiveness. By dissolving the protective barrier of bacteria, it makes it susceptible to the activity of drugs. It even affects spirochete responsible for the development of borreliosis, therefore it is often included in the treatment protocol of this disease. Serrapeptase may be used to mitigate undesirable symptoms accompanying the ailments of upper respiratory tract. Respiratory system diseases, especially inflammations of sinus, bronchial tubes and lungs, are usually characterized with the increased production of thick mucus. Serrapeptase restores proper physicochemical properties of the mucus – decreases its tenacity, positively influences elasticity, facilitates expectoration and elimination from the organism. Additional advantages are anti-inflammatory and anti-swelling properties of serrapeptase. In clinical studies, patients treated with serrapeptase, after a few days felt a noticeable relief in the form of the decrease and attenuation of secretion, mitigation of discomfort caused by the feeling of “clogged nose” and the decrease of pain symptoms. Summing up, Serrapeptase is a preparation positively influencing human organism. It supports the process of regeneration of damaged tissues, decreases inflammations and swellings. In many cases it may replace popular synthetic painkillers, without causing any risk of side-effects. Serrapeptase 120.000 SPU 90 caps. Take 1 capsule daily, away from food. Pure serratiopeptidase, top quality and high activity. I would recommend this to anyone who is struggling with swelling or osteo-articular pain . In my experience that's as effective as nonsteroidal anti-inflammatory drugs, yet completely safe. Does not irritate the stomach. It will also be useful to those who suffer from chronic sinusitis. The dosage of serrapeptase depends on the product that is in the possession. It is conditioned by the activity of the enzyme. It is established that in the prophylactic supplementation the average dose is 40,000 units, which in the case of presented formulation means 1 capsule per day. In the case of pain, injury and accompanied swelling or in inflammation of the upper airways the dose can be increased up to 2 capsules a day. Serrapeptase is taken on the empty stomach, which means that after eating food one should wait for at least 2 hours and only then consider taking the supplement. After the use of the supplement do not eat for at least half an hour. The effectiveness of serrapeptase can be increased by taking it together with zinc or manganese. It is important to know that serrapeptase can enhance the effects of antibiotics which are used in a fight against pathogenic biofilm. Cellulose, Serrateric™, modified cellulose (vegetarian capsule). Serrapeptase is a proteolytic enzyme (breaking down protein) obtained from the digestive system of silkworms – moths, specifically its larvae. It can be formed in the fermentation process owing to enterobacteria Serratia sp. E-15. For silkworms, this enzyme is significant to dissolve their hard cocoon and promotes the digestion of indigestible mulberry leaves. For humans, serrapeptase may have in turn a positive impact on bodily functions, in particular cardiovascular function. It is absorbed directly through the intestines into the bloodstream. It is suggested that the enzyme may break down, among others, clots, fybrosis and atherosclerotic plaque owing to its ability to “dissolve” dead tissues. Consequently, it may have a special supporting role in arterial embolism and atherosclerosis. A similar mechanism of action is observed in external protective layers of cancer cells – by dissolving them, it may promote anti-cancer processes. This enzyme is characterised by anti-inflammatory properties and that is why it can bring relief, e.g. from pain caused by rheumatoid arthritis or carpal tunnel syndrome.